"If any one of you is without sin, let him be the first to throw a stone at her,” (John 8:7 NIV). And as the hard-hearted Pharisees gathered round, a spiteful plan to trick Jesus began to unfold. The sun was just peeking through the securely locked shutters of Morah’s bedroom window. The predawn stillness was broken only by the songs of early rising birds floating on the breeze. Morah was a tangle of sheets, arms and legs as the man she loved lay sleeping beside her. Morah’s musings were suddenly interrupted by a banging on the door. “Open up!” the gruff voice demanded. “Who is there?” Morah cried as she scrambled to find her robe. Before Morah could even think to answer, the angry mob of religious men broke through the simple lock and into the lovers’ hideaway. The Pharisee tossed Morah her night robe, but failed to turn his head as she slipped her trembling frame from the cover of the sheets and into the thin cloak. He grabbed her by the arm and began dragging her to the door. “Where are you taking me?” she cried. “You’ll find out soon enough,” the Pharisee growled. “What about Zachariah?” the youngest man of the group inquired. “Why don’t you go back to your wife where you belong,” the Pharisee called over his shoulder as the group left the room. And with that, the conspiring mob continued their trek to the temple with the half-clad trembling woman in tow. Two men flanked the weeping woman on either side, dragging her through the early morning hustle and bustle of the city. The bait was hooked, and now it was time to reel in the catch. Like mice following the Pied Piper, a curious stream of townsfolk joined the parade. Jesus was already teaching in the courtyard with a group gathered at his feet. As always, Jesus’ message and miracles drew large crowds. A distant rumble interrupted his gentle teaching as the angry mob and curious crowd approached. They marched right into the inner circle of the classroom and thrust the woman at the Master’s feet. Morah’s unbound hair fell around her bare shoulders and fluttered in the early morning breeze. Her shame-filled eyes stayed riveted on the earthen floor, refusing to meet Jesus’ gaze. Then one of the men pulled her to her feet and displayed her for all to see. She didn’t need to look at the man before her. She recognized his voice. It was Jesus. Jesus didn’t look at the woman’s half-clad body as the others openly gawked. He looked into her soul. Morah lifted her eyes and looked into the face of love. What do I detect in His gaze? She thought to herself. It wasn’t contempt, disgust, or condemnation, but rather compassion, concern, and pure, unadulterated love. Somehow she knew that this was the look she had been searching for her entire life. As Morah listened to the Pharisee’s question, she understood Jesus’ dilemma. If He set her free, the Pharisees would accuse him of ignoring the Law of Moses and deem him a heretic. If he sentenced her to death by stoning, then His teachings of grace and forgiveness would be negated. The religious leaders already held the stones in their clenched fists, anticipating His reply. Their hearts were as hard as the rocks they held in their hands. But rather than give a quick answer, Jesus moved his gaze from the trembling woman and stooped to the ground. With His finger, the very hand of God-made-man, he began writing in the dirt. A frigid chill swept through the Pharisees pious robes. Suddenly they felt the rawness of naked exposure as Jesus’ eyes looked up at each of them and without a word, uncloaked their sinful thoughts and desires. With one look from Jesus, they stood soul bare and more exposed than the half-dressed woman before them. One by one the Pharisees unclenched their fists, dropped the stones, and filtered through the crowd. The older men who had accumulated a longer list of sins turned to leave first, with the younger ones not far behind. The woman turned to leave, but not before picking up a discarded stone to take with her. Dear Lord, this story of Your great mercy and grace takes my breath away. Just to think that the only person qualified to throw the stone was the very One who set her free. Help me to always remember that You have forgiven me of my sins. Help me to drop the stones I so quickly pick up to cast at others and extend to them the same grace You have extended to me. When is the last time you held a rock of condemnation in your hand? Not a real rock, but a judgmental attitude? When is the last time you acted like the Pharisees who were so quick to condemn? Who do you want to be like, Jesus who showed grace and forgiveness, or the Pharisees who wanted to give her what she deserved? When was a time when you felt grace and mercy from someone in your life? 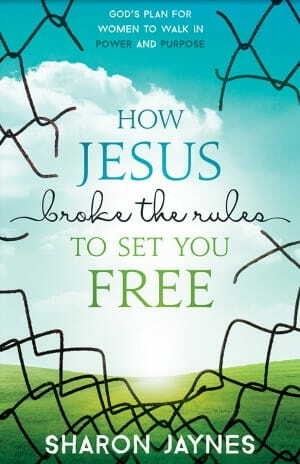 Today’s devotion was taken from my book, How Jesus Broke the Rules to Set You Free: A Woman’s Walk in Power and Purpose. In this book we study each woman Jesus encountered in the New Testament and see how her story is your story. Jesus came to set women free! In a day when they moved about as shadows in the culture, rarely seen and seldom heard, Jesus broke the cultural rules to heal them, save them, and then send them. He risked His reputation to save theirs…and yours. The book comes with a study guide and is perfect for women’s Bible study groups. But be prepared, you’ll fall in love with Jesus all over again. Click on the book to watch the book trailer. That is a blessing in itself! Right now, this book is on sale for 33% off.